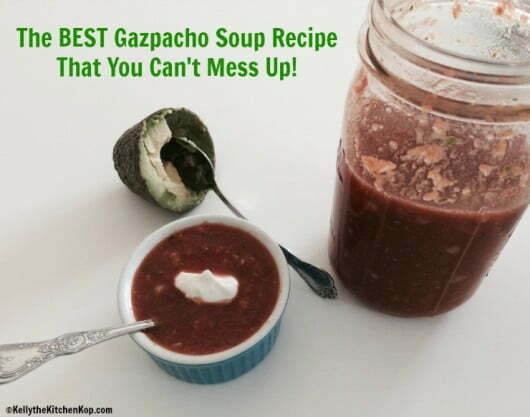 The BEST Gazpacho Soup Recipe That You Can't Mess Up! I love this time of year when the produce is coming in and fresh foods are abundant, they just taste so good, especially if you buy from a farmer who knows about the importance of healthy soil and the difference it makes in the amount of nutrients! You probably know there are some “raw foodies” out there who strongly believe that we shouldn't eat anything cooked, and I certainly don't agree with that because in traditional cultures they always cooked some of their food, and besides, did you know that certain foods are better for you when cooked? Greens like spinach, chard and others shouldn’t be eaten raw, such as in a green smoothie, because they contain oxalic acid, which blocks mineral absorption. (Check out this superfood smoothie though.) Oxalic acid is reduced by cooking, though, so just give it a light steam before you toss it into your smoothies, it's easy. Cruciferous vegetables, such as cauliflower, cabbage, broccoli, kale, and a few others, should also be gently cooked before eating them to reduce the goitrogens, which are substances that suppress the function of the thyroid gland. (Source and more info on the above.) Not that we never eat raw cauliflower or broccoli, but it's not something you should do every day. However, the Weston Price Foundation has always said that we should definitely have some raw foods in our daily diets for the wonderful nutritional enzyme boost. 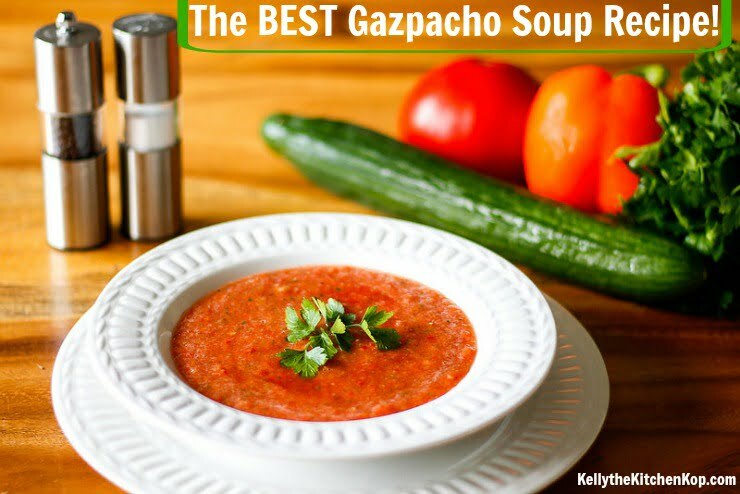 And now also the recipe below — make sure to read all the way to the bottom of the post for my tips on making this the best Gazpacho recipe! Note in the recipe below that you'll want to use as many organic ingredients as you're able, and *check the “Dirty Dozen” list for those that are most important to buy organic. And sour cream to serve on top too — we like a lot! Optional: sriracha sauce on top — this one is my favorite because it tastes SO good and has no preservatives! Add half the tomatoes, cucumbers, onion, and pepper into a food processor. Add about 1/2 cup of the tomato or vegetable juice and puree the vegetables. While the food processor is on and is pureeing, slowly pour your oil into the food processor. Toss in the cilantro and pulse chop until it's the size you prefer. Dump this puree into a large bowl. Stir in the rest of the tomato/vegetable juice and the red wine vinegar. Put the remaining vegetables in the food processor and pulse chop until they are the size you like. Combine all these ingredients in the large bowl and give it 24 hours before you dig in, if you can, because the tastes come together even more. Chop up avocado and add pieces when serving along with sour cream if desired. Don't forget some siracha if you like a little kick. Not too much because you'll still want to taste all the fresh flavors from the vegetables. Important: This tastes so much better after 24 hours. Making it in advance is important for best flavor. How you process it in the food processor depends on how smooth or chunky you want it. I like mine with some texture and small pieces, so I pureed half the ingredients and pulse chopped the rest until they were the size I wanted. Food processor bowls vary in size. You might need to chop and puree in batches. Just don't skip the step where you slowly add the oil while it processes, that thickens it up. Some people prefer to strain the puree to get out any seeds from the tomatoes. If you want to do this, be sure you do it before you add the cilantro. This is a great base recipe. You can add more or less of anything, leave something out, add something new. It's really hard to mess up! We also LOVE these kale chips! Read more from Sarah about other veggies that should be lightly cooked before eating. Also here’s Dr. Kaayla Daniel: Plants Bite Back. Scroll down at this post to read about why dirt matters! Don’t parsley and cilantro both have high levels of oxalic acid? I had to look it up! Parsley does, but cilantro not so much, so that would be the better choice, thanks!